Idols? Farmers? Niigata Rice Girls! These days there are a lot of beautiful, gracefully aging women in the world. With this in mind I would like to share a Youtube video of some very attractive older Japanese ladies 😉 They are members of Niigata prefecture’s special PR group, “Niigata Rice Girls”. According to the prefecture’s official Facebook page, Niigata Rice Girls formed last year, comprised of seven female farmers in their 50-70s. Their mission is to promote their Niigata local rice! And, they created a lovely promotional video featuring their theme song, “Kome Iro no Kata-omoi” (Rice Colored One-way Love). 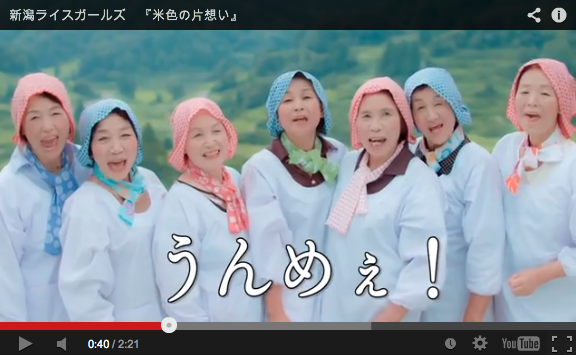 In this video, the seven women sing and dance just like idols half their ages. The real differences from regular idols is that the Niigata Rice Girls’ performance is set in a rice field rather than on a stage, and instead of microphones, the ladies hold tools suited for harvesting Niigata rice. I hope this unique group continues to gain popularity and can successfully promote their delicious rice more and more!